Daily Classic™ contains Chondroitin Sulfate to support healthy bones and joints. 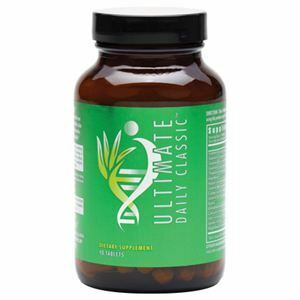 Ultimate Daily Classic™ tablets come in an advanced protective glass container for maximum standardized quality, freshness and safety. Ingredients: Vitamin A, Vitamin C, Vitamin D3, Vitamin E, Thiamin, Riboflavin, Niacin, Vitamin B6, Folate, Vitamin B-12, Biotin, Pantothenic Acid, Calcium, Iron, Iodine, Magnesium, Zinc, Selenium, Copper, Manganese, Chromium, Potassium, K-Cysteine, DL-Methionine, Para-aminobenzoic Acid, Inositol, Chondroitin Sulfate, Dimethylglycine, Thymus Gland Powder, Ginkgo Leaf, L-Carnitine, Bilberry Fruit, Co-enzyme Q-10, Hawthorn Berry, Microcrystalline cellulose, plant cellulose, stearic acid, magnesium stearate, silica and pharmaceutical glaze.